Nightfall is a multimedia sculptural installation comprised of a large layered plastic diorama made with a CNC router and a video projection. In a darkened room the viewer looks into this portal to see a an unknown world of never ending twilight. 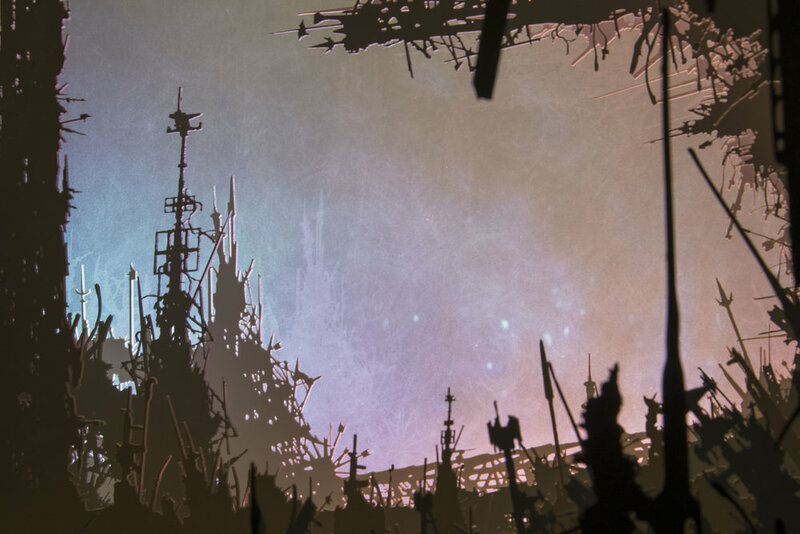 Future ruins backlit by the soft glow of an animated digital night sky. Within the details of this beautiful world are hits of its more sinister origins. This piece references Isaac Asimov's science fiction story with the same name, in which there is a myth of past civilizations in unending daylight falling into ruin during a once every 2,000 year eclipse. This piece depicts a world in ruin after the fall of technology, caught in perpetual darkness.